Intelligent Port Detective Technology : With smart Super-Fast Technology, each port intelligently identifies your devices and perfectly matches the maximal charging speed to targeted device (up to 8A in total, max 2.4A each port). Powerful Ever : The energetic and powerful USB multi charger assembly provides 50 watt and 8 amps total currents. That is how the USB charger box goes powerful way charge your multiple devices at the same time with ultra-speed. Multi-Dock Design : Compatible charging with 8 devices simultaneously. 50W power output among 8 ports,the USB block can charge any combination of smartphones, tablets or other of USB-charged devices. This would be great for lighting speed charging on any corner, side table or setting on either work desktop or the kitchen counter. 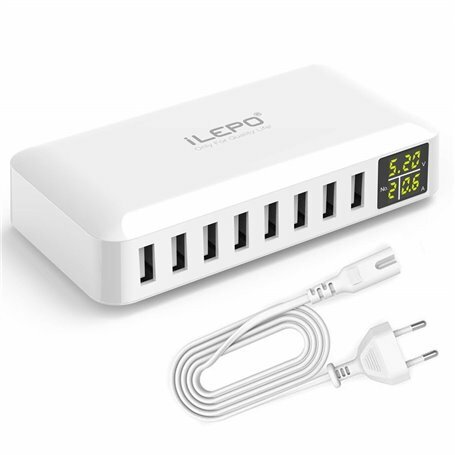 Safe and Compact : On the outside, 8-Port USB charging station is fire-resistant and comes with a sleek bright white finish. Inside, the compact body is a new generation of the circuit design with overcharging, overheating, short circuit protection, and even 100V to 240V input for use around the world.